In large bowl, beat shortening with electric mixer on medium speed 30 seconds. Gradually add granulated sugar, about 1/3 cup at a time, beating well after each addition and scraping bowl occasionally. Beat 2 minutes longer. Add egg whites, one at a time, beating well after each addition. Beat in vanilla. On low speed, alternately add flour mixture, about one-third at a time, and 1 1/4 cups milk, about half at a time, beating just until blended. Spoon 1 1/2 cups cake batter into small bowl; stir in 1/4 teaspoon peppermint extract and paste food color to make red batter. In each muffin cup, spoon about 1 tablespoon white cake batter. Top with about 1 tablespoon red batter, then another 1 tablespoon white batter. With table knife, draw an “S” in batter of each muffin cup to swirl batter. Bake 18 to 20 minutes or until toothpick inserted in center comes out clean. Cool 5 minutes. Remove cupcakes from pans; place on cooling racks. Cool completely, about 30 minutes. In large bowl, beat powdered sugar, butter, 1 teaspoon peppermint extract and 6 tablespoons milk with electric mixer on medium speed until smooth. Beat in additional milk, 1 teaspoon at a time, until frosting is smooth and spreadable. Spread scant 2 tablespoons frosting on each cupcake. 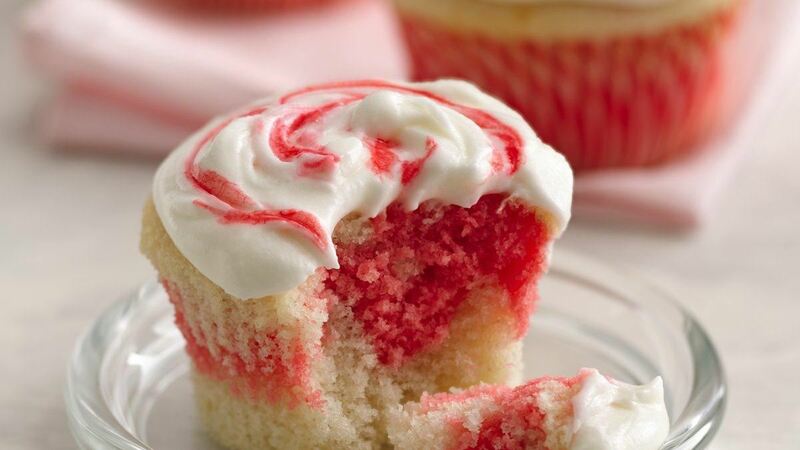 With tiny paintbrush, “paint” liquid food color in swirl pattern on frosting on each cupcake.